While spending huge amounts of money on setting up insulating systems in your attic and installing energy efficient doors and glass windows, you could be forgetting one very important thing – your attic door. The final thing your attic needs after all other insulation is optimized is to seal that attic door with attic tents. For obvious reasons, your attic door is not insulated, so any residual heat in your attic will go to and leak through your attic door. Heat trapped in your property’s attic could leak into your living spaces, causing the temperature inside your home to spike. That’s why you need an Attic Tent. Can a regular insulating system remedy all this? Unfortunately, no. Ordinary insulating systems are not designed to stop heat from leaking through gaps on the attic door. With Attic Tents, you can create an airtight seal around the door of your attic. This ensures that hot air is trapped inside the attic. Now, there’s no more need for you to spend hundreds of dollars on sophisticated energy-efficient doors. With an Attic Tent, you can take advantage of its cooling comfort with only a fraction of the cost. You can say goodbye to expensive installation costs and invasive repairs that cause unnecessary damage to other parts of the home. With our Attic Tents, installation normally takes less than 60 minutes and the benefits are long-lasting. Quick installation – Setting up is quick and easy. No bulky equipment to be used and no annoying woodwork. Affordable – Our Attic Tent solution is inexpensive yet super effective. It helps you achieve energy-efficiency and cost savings like no other. Comprehensive Warranty – With our comprehensive two-year warranty by the manufacturers, there no more need for you to worry about reliability and durability. From Insulsure Inc., Attic Tents are an innovative yet simple and clever way to stop some of the biggest problems that many properties are faced with in terms of insulation. It effectively stops hot air from leaking out of the attic. Hassle-Free Use – Using Attic Tents is as easy and convenient as zipping open an actual tent. No gimmicks, no complicated gadgets and no cumbersome equipment. Maintenance-Free Operation – Attic Tent sports a non-corrosive zipper that resists decay, rot, pests and rust. You can easily install it without requiring any maintenance. Versatility – Whatever type of door you may have in your attic, you can safely install Attic Tent. Tax Advantage – Austin attic tents are backed by Energy Star which allows you to become eligible for energy tax credits. The manufacturer of Attic Tent has a strict quality assurance. They want to make sure that quality of installation and handling of product is carried out according to their specification. That’s why they choose only a handful of contractors to install their products. 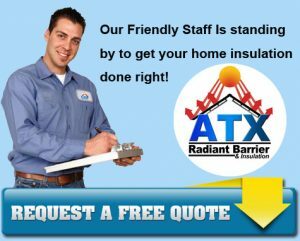 One of those contractors is ATX Radiant Barrier & Insulation, the leading providers of attic tents in Austin. Stop wasting money on needless energy consumption. Take the smart step of choosing an Attic Tent.